The fact that I’m not satisfied with the pizza here in Melbourne should clue you in on the fact that I am a transplant. Locals, born and raised here in Central Florida are, unfortunately for them, unexposed to a good pizza. I’m not sure why the talent for making a good pizza ends outside of the Northeast, but it seems to. The pizza shown above is a Stuccio’s Pizza. I consider it the best pizza on the planet, and I judge all other pizzas against it. It has a thin crust, sweet sauce, and the extra large comes in this giant rectangular size. Stuccio’s Pizzeria is located in Berwick, Pennsylvania. What is a good pizza? It’s hard to explain without a common frame of reference; but, I’ll try. 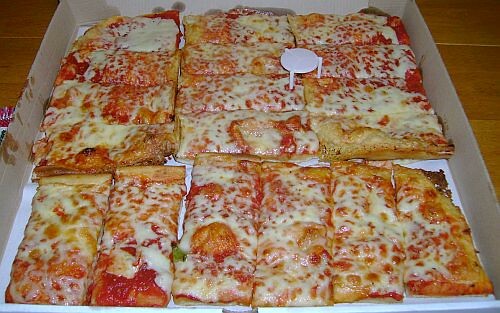 Let’s start with what a lot of people consider the bench-mark style of Pizza, New York Style. Imagine Sbarro pizza, the brand you can get at most malls or airports. Now, imagine the crust tastier, the sauce more delicious, and the mozzarella cheese charred just a bit; now you’ve got a New York Style pizza. A lot of pizza snobs stop there and say, “Now that’s pizza.”, but not me. Let’s take it a step further. Imagine that New York style pizza, but with a creamier cheese than mozzarella, and imagine the sauce sweeter and even more delicious. That’s an NEPA (Northeastern Pennsylvania) style pizza. Now THAT’s a pizza! 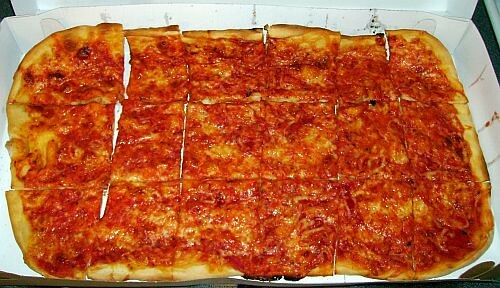 The pizza above is an NEPA Sicilian style from Norm’s of Wilkes-Barre, Pennsylvania. The crust resembles a Pizza Hut pan pizza, however the similarities end there. A stewed tomato sauce and mozzarella cheese top this crispy crust to make a delicious combination. I have been on a search for a great pizza here in Melbourne since I arrived. Sad to report, I haven’t found it yet. If any of you out there have any suggestions, I’d love to hear them. I’ve had Bizarro beach side many times, and It’s a good start. I’ve also heard about this Brooklyn Pizza in Viera that I’m going to have to check out. Any more?